Peter Courtney said 1990s tax measures make improving graduation rate particularly daunting. 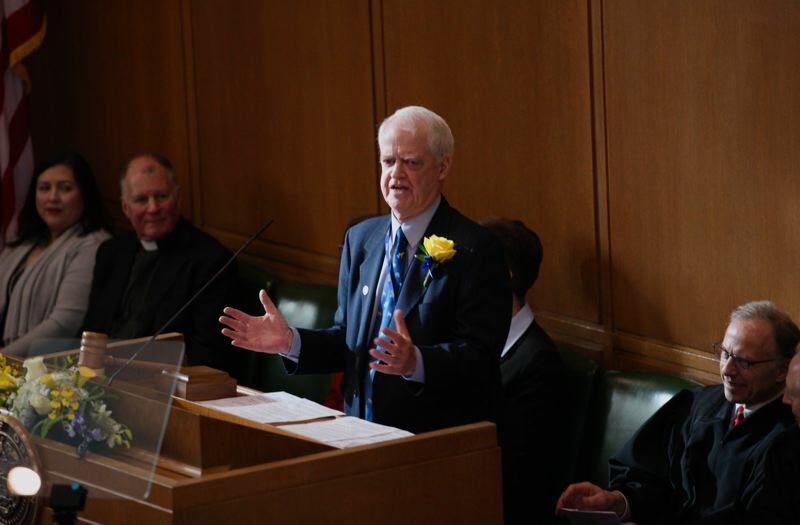 Senate President Peter Courtney on Friday compared fixing Oregon's public school system with climbing Mt. Everest, the world's tallest mountain. Two 1990s tax measures — Measure 5 and Measure 50 — have made education reform particularly daunting, Courtney said. He made the comments at the opening meeting of the Joint Committee on Student Success. Courtney, D-Salem, and House Speaker Tina Kotek, D-Portland, appointed the group of 14 earlier this month and tasked them with holding hearings around the state and coming up with recommendations to improve Oregon's public school system. Oregon's public schools yield the nation's third worst four-year high school graduation rate. "The story you can tell and must tell simply can't be aspirational or theoretical. I will really not want to see a list of principles and vague suggestions," Kotek said. "We really need to know how we are going to do this." The changes the committee recommends need to be "stable, sufficient and accountable," she said. Without Measures 5 and 50, Oregon would have an additional $3.5 billion in revenue per year, $2.2 billion of which could be used for K-12 schools, according to a preliminary analysis conducted by the Legislative Revenue Office and requested by Courtney. That's about double the amount of additional revenue that the state Quality Education Commission has determined is necessary to sufficiently fund K-12 schools. Passed by voters in 1990, Measure 5 limited the amount of tax levied per $1,000 of a property's real market value to $5 per $1,000 for education districts and $10 per $1,000 for city and county governments. If taxes in either the education or general government category exceed those caps, the taxes are reduced to comply with the limit. The reduction results in millions of dollars in lost revenue for schools and local governments each year. Measure 50, approved in 1997, enacted a permanent operating rate limit for all existing tax districts. The rate was calculated largely by combining existing local tax levies existed. The tax rates cannot be changed by any action of the tax district or voters and remain stagnant since 1997, despite a burgeoning state economy in the past couple of years. Voters can approve a "local option levy," which allows a taxing authority to temporarily exceed the permanent rate limit for up to five years for operations and 10 years for capital improvements. As a result of the measures, state lawmakers budget hundreds of millions of dollars more for K-12 for the state's biennial budget, and "immediately hear how it's not enough," Courtney said. "It's a problem, I believe, that we have been chasing since the passage of Measures 5 and 50 in the 1990s," he said. Before Measures 5 and 50, the state's K-12 funding was 6 percent above the national average in 2016; now, it's 11 percent below the national average, according to the Quality Education Commission. Despite the financial hurdles, "this committee's work cannot simply be about money. Money alone will not solve all these problems," Courtney said. The committee also needs to come up with policy reforms, including looking at enabling schools to offer year-round school, advanced placement courses, fee-free extracurricular activities, and international baccalaureate diplomas, he said. My hope … my wish … is for the Joint Committee on Student Success to find out what kind of education system Oregon needs," he said. The committee was modeled after a joint committee on transportation assembled two years ago to craft the $5.3 billion transportation-funding bill that passed last year. "Transportation was a tall mountain to climb; this is Mount Everest," Courtney said. "But by addressing these issues, we can set Oregon on a path for an extraordinary future." The student success committee's recommendations and an accompanying budget proposal are due in 12 months, Kotek said.